The Huawei Watch 2 is a very solid Android Wear 2 timepiece, but despite the marketing, it's not the perfect smartwatch for fitness tracking. Huawei Watch 2 was unveiled in February at Mobile World Conference (MWC), and wearing the 1.2-inch-screened, rubber-strapped, 4G-toting smartwatch on-and-off for the past month, we have this to say: it is good. We also got to play with Huawei Watch 2 Classic, which is the same thing but posher looking, and with no 4G. But we're not reviewing that watch here. The only pricing we have so far is €329 (around £320) for the Watch 2. UK launch date is April. No Classic price is set. Watch 2 has a rubber, interchangeable strap in a choice of colours, wrapped around a 42mm face bearing a 1.2-inch, 390x390 (326ppi), Gorilla Glass screen, flanked by two buttons and surrounded by a ceramic bezel approximately the size of Cheltenham. It's IP68 resistant to dusty and watery assault. Unfortunately, the design seems like a regression from the original Huawei Watch. The screen is smaller and the bezel is larger, which makes the UI feel cramped. Tech Sherlocks amongst you may well have guessed from this that it's aimed at fitness fans – who love rubber, but care less for aesthetics – and has 4G built in. The bezel is ceramic in part because that causes less antenna interference than a metal one. There will also be Wi-Fi only versions of Watch 2, should you not require complete untethering from your mobile. I'm just going to come out and say it: as a watch, this is not hugely attractive. But hey, it's also not actively offensive. You might call this damning with faint praise, but as watches aimed at fitness enthusiasts go, it's officially not bad looking. Apart from the white-flecked one with yellow accents; that's disgusting. One positive thing about the design is how comfortable it is. Watch 2 is certainly one of the most lightweight and ergonomic smartwatches we've ever worn. Not only is that perfect while exercising, it's also great for everyday wearability. Watch 2 also has one other design ace up its sleeve: set it to battery-saving mode and the battery will last for THREE WEEKS. What can you do in battery-saving mode? NOTHING. It'll just count your steps and tell you the time. But still, nice idea. Incidentally, in 'normal use', two days of battery is promised, and that's with the 'always on' screen, 'always on'. Depending on how many notifications you get you may or may not get the full two days - but the Watch 2 is one of the best performing Android Wear watches when it comes to battery life. With absolutely everything switched on and working away, it'll last a perfectly acceptable 10 hours. I say that's acceptable because there is a LOT of battery-sucking stuff packed into this watch, much of it is running related and, I don't know about you, but I don't usually run for more than 10 hours at a stretch. 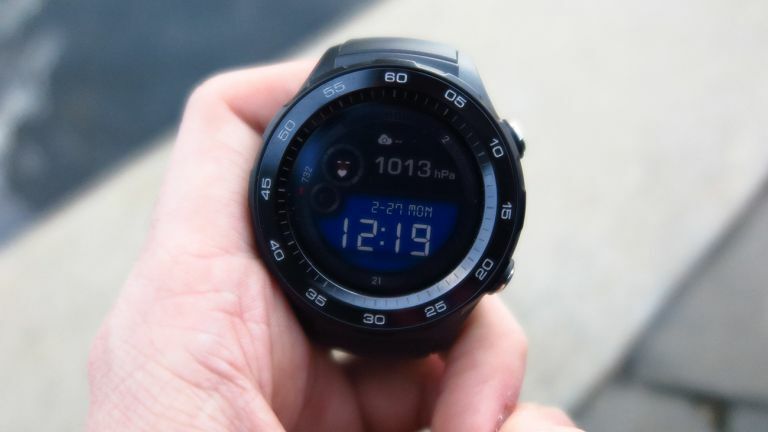 What's really impressive about Watch 2 (Electric Boogaloo) is that it packs in a comprehensive list of sensors, connectivity options and gizmos: GPS, barometer, Wi-Fi, Bluetooth, 4G, an optical heart-rate reader and motion sensing are all aboard. 4G connections come courtesy of the first major update to Android Wear since its launch. It's entitled, logically enough, Android Wear 2. A SIM tray sits in the bottom of the watch, ready to take the SIM from your phone, when you feel like heading out phone-less. Seriously, nobody is going to do that, are they? Using a cheapo second SIM seems a much less irritating option. Via the Watch 2 with Android Wear 2, you can now roam free, and make phone calls via the built-in mic or, more realistically, Bluetooth headphones. Although the wearable has Android Wear 2 in it, and 2 buttons, one feature it is lacking is any form of rotary control. So no, that enormous bezel can't be twisted to scroll through options. Also, although the buttons do twist, suggesting they could be used for crown control, Apple Watch-style, in point of fact, they cannot. So why make them twist then? That's just toying with us. Anyway, the second button can be programmed to do whatever you want. By default it's set to running related features, but we set it to open Android Pay. On paper, this could be a cracking running watch. As noted, the sensor set is comprehensive, which is more than can be said for Apple Watch Nike+. It's able to track you on the road and – thanks to an altimeter – up and down hills, whilst noting your heart's racing pulse. It's easy to access shortcuts to bike and gym tracking modes but more interesting than that are the options for runners. Preset 'fat burn' and 'cardio' guided workouts use voice instructions to push you to the correct heart rate and keep you there. Presumably by shouting things like, "Speed up fatso, or nobody will love you." The same virtual instructor will also warn you if you're going too hard, and give regular updates on pace and distance. The same sort of assistance could presumably be added for cyclists, gym bunnies and stand-up paddle boarders in due course. So basically, what we have here is a potentially excellent fitness watch that also happens to be a full-on Android smartwatch. Unfortunately, while the GPS and step-tracking is accurate enough, the heart-rate sensor follows on in the tradition of other Android Wear smartwatches - it's pretty unreliable. We'll be doing a separate review of the Huawei Watch as a running watch, so look out for that. There is a less sporty alternative to Huawei Watch 2, and it's the Huawei Watch 2 Classic. This looks almost identical, but has a more sober colour choice, a leather strap and stainless steel bezel. It's also functionally identical, as far as I can see, but lacks a 4G option. As both watches have interchangeable straps, you could presumably use a leather one by day, then switch to a rubbery one for your workout. Or just buy two watches. Whatever. Watch 2 has a bright screen and everything runs smoothly and speedily. It's incredibly comfortable and the look is, if not great, then at least acceptable. It's unfortunate that Huawei hasn't included any rotary controls on this, especially as the bezel is a big old thing and as such probably quite easy to grip 'n' twist. Despite that, it's a very competent Android Wear 2 watch. What's more interesting, however, is the concentration on fitness. While it features all of the necessary sensors to track running, cycling and swimming, our initial testing has revealed the Huawei Watch isn't the stellar performer we hoped it would be. Which is a shame, because emphasising the fitness element was exactly the right thing for Huawei to do, and hopefully the company can improve its fitness tracking software updates. One final note we'll say about the Watch 2, something we're having trouble putting our fingers on. While the screen is small, the UI cramped, and the fitness tracking poor - we really enjoy wearing the Huawei Watch 2. It's incredibly comfortable, and just has a certain 'wearability' factor that makes us keep coming back to it.